God Will Get The Glory! | Reflection of Glory! HomeGod Will Get The Glory! God Will Get The Glory! I looked around my room and realized the time had come! There were piles everywhere! Clothes, books, papers, shoes…how had I let it get so junked up? I like for things to be organized. I like to have things in place. When my surroundings are in order…I feel more in order. When things around me are in chaos…I feel a sense of being out of control. There is so much going on in our world right now. It is easy to get caught up in the things that are piling up around us. It is easy to let ourselves get caught up in the chaos that is swirling around us. So! I was determined to get those things under control that were indeed in my control. As I began to pick up one thing after another and put it in its correct place, I found myself picking up an upside down post-it note holder. 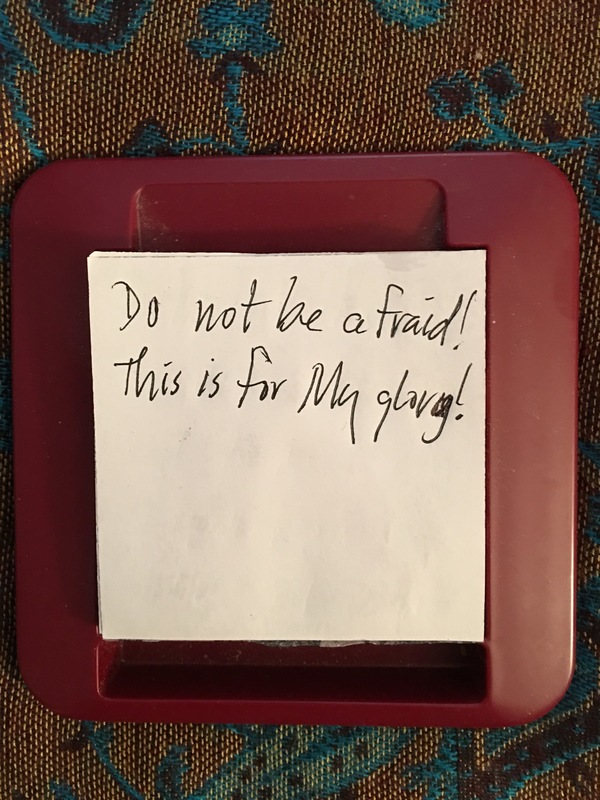 As my eyes fell on the note that I had scribbled down sometime in the past, I stopped and received the message that God was speaking to me right now! Brothers and Sisters, no matter what is happening in your life; no matter what chaos or disorder you are dealing with; hear God speaking! Do not be afraid! He is with you! He will cause ALL things to work together for your good! And when all is said and done —HE will get the glory!! HALLELUJAH! !